They've done a good job at this since Black 2 and White 2, let's hope they keep it up. Probably only the Hoenn Dex is going to be there pre-Champion, but we can at least hope for most of the original 386, right? Trumpets of Hoenn, 3DS sound card. Need I say more? Or make the rest of the game harder. X and Y were easy enough without it. - Expanded story between Team Aqua and Magma. They mentioned something about the game being expanded, didn't they? Maybe they can even make amends for X and Y! Will probably think of more later. We'll probably get either the Latiosite or Latiasite depending on which version we get it in. For the love of arceus please give mega evolutions to all the Hoenn starters. Mega Evo's for the Starters. Bring Back Mega Evolutions in General. .....Mega Bisharp pls and thank you. Last edited by JDxImpetus; May 7, 2014 at 02:30:01 PM. I hope they fix the lag with 3D in battles. I don't use it often, but it looked good when I did. I also hope that Wonder Trade is still included, as well as most of the bottom screen stuff from X/Y. Finally, though not really an expectation, I hope that the EXP share is nerfed. One the game is completed, however, it goes back to how it was in XY. I find it fantastic for quickly raising a group of weak Pokemon for evolution to complete the National Dex. Walking Pokémon. YOU KNOW YOU WANT TO, GAME FREAK. Agreeing with everything that's been said so far... I might be the only one here, but I hope that the Trick Master returns. I enjoyed his little puzzles, and you could potentially do a lot more with the 3DS graphics. Contests. These were fun. And they've been only in R/S/E. Please put them back in. I seem to recall that Pokémon contest data was retained in the Black and White games, though it was never used. Anyone know if it carries over to X and Y, also? No, it's been gone. But it's Hoenn, and what's Hoenn without contests and Milotic? Secret Bases! We need these, it would be awsome to visit a friends base and battle his team. Can't believe I forgot to mention this earlier, but I neeeed Match Call and with that a lot less stress on the double battling (Specifically not having to double rebattle gym leaders.) Hoenn might've introduced it, but after all this time I'm tired of it. -I'd like to see some walking Pokemon! I expect the game to have Pokémon in it. I'm really curious to find out who directed this game, I can imagine it won't be Masuda since he's fresh off of XY. It's probably Morimoto since the last game he directed was Heart Gold which is bad since I think he didn't change enough, but also good since he directed Emerald which vastly improoved. Personally I'd prefer if it was Unno directing again after BW2 but I doubt it. I came up with something else today. If they included Super Training again, I would very much like it to be a little more lefty-friendly. Please, GameFreak, I'm begging you. I advocate this lefty love. But then again, I don't want to buy a Circle Pad Pro if that's their idea of equality. Oh, although there might be the same level of character costume customization as in X and Y, I want to be able to switch freely between the R/S outfit and the Emerald outfit. Just cause, I appreciate options. 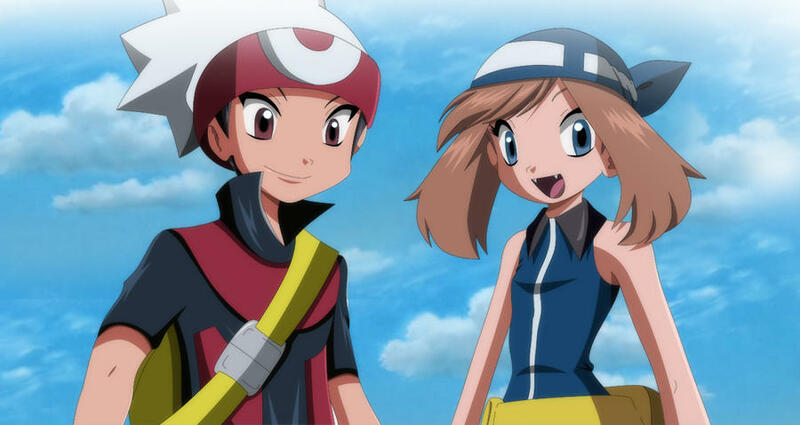 I want the new character outfits to look like Ruby and Sapphire's in the Emerald Arc of Pokemon Special. I also hope whoever draws the redesigns remembers that thing Brendan wears is not his hair, I have a bad feeling that's gonna happen. Last edited by Magmaster12; May 12, 2014 at 05:22:26 AM. Ok look, it's gotta be in full 3D now. Not just the Single Battles and some of the places in the game. If we're gonna have hordes, kick out Super Training. Allow EV reducing berries to be found easily (I think they kinda were back in Emerald.) Pokemon Amie can leave, too. I want more focus on the game and story than these small gimmicks that end up being left in the dust. Well, to me, anyways. RSE is a very good candidate to have an extended story, like DPP. I'm uncertain if this game will take Emerald's story or what, but I wouldn't mind if Groudon or Kyogre go berserk and consume the world with their respective element. Edit: Add the possible Mega Evo, and having Groudon or Kyogre go mad with power can actually work. Last edited by Sub-zero; May 12, 2014 at 06:52:35 PM.